Across the court stands the large shrine of Ramses III. It was a sort of Way-station for the barges of Amon, Mut and Khonsu when they were carried in procession by the priests. The pylon which forms the entrance has now been repaired and shows, on the left-hand tower (d), a relief of the Pharaoh wearing the double crown and holding a group of prisoners by the hair, whilst in his other hand he raises a club to smite them. Amon stands before him handing him the sword of victory and delivering to him three rows of vanquished cities each represented as a human figure rising out of a symbolic fort which bears the name of the city. On the right-hand tower (e) the theme is repeated but with the Pharaoh wearing the crown of Lower Egypt. Large statues of the Pharaoh flank the doorway over which Ramses III receives the symbol of life from Amon. Passing through the entrance pylon we. come to an open court surrounded by covered passages on three sides, each supported by eight square pillars with statues of Osiris in front of them. On the terrace at the rear are four similar pillars and four columns which have bud capitals. The reliefs on the back wall of the pylon (/) show Ramses receiving the hieroglyph for ‘jubilee’ from the enthroned Amon. 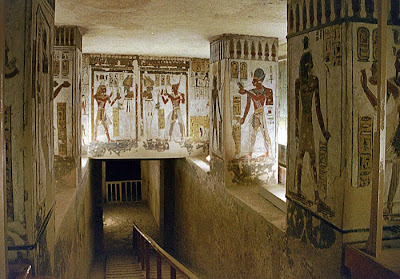 On the east wall (g) is a procession of standard-bearers and the Pharaoh leading the priests who bear the sacred barges of Amon, Mut and Khonsu. The hypostyle hall of the shrine of Ramses III has eight columns with papyrus-bud capitals, adjoining which are three shrines respectively dedicated to Mut, Amon and Khonsu. This shrine is a cameo. It is like a small temple, adhering to traditional temple layout. Its historical importance is its completion according to the unadulterated blueprint of Ramses III. 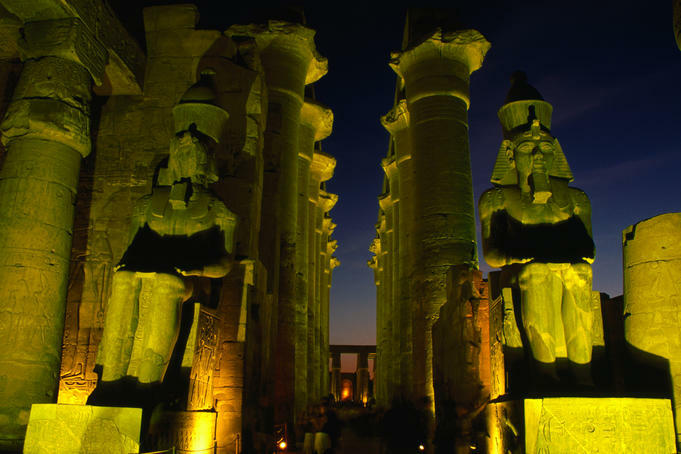 Ramses III ruled at the tail end of a long line of imperial Pharaohs and he was the last of the Ramessides to carve a place for himself in history. Though wealthy having reaped the fruits of his ancestors’ battles he was far from great, a fact that he seems himself to have recognised by placing his shrine across the axis of the main structure at Karnak as though to say ‘I do not wish to compete’. During his 32-year reign he fought three important battles, and his architectural activities included a temple at Medinet Habu (page 92) where he recorded his battles, and the initial construction of the temple of Khonsu (page 63), which was completed by his successors. He also enriched the temples of Memphis and Heliopolis but ended his days severely criticised by his contemporaries, who despised his weakened position under the priests of Amon.